At first glance, the Echoes resemble lean, tall humans. However at a closer look one may immediately notice their pale-blue skin and cold silvery eyes with blue glow. Their bodies changed in such a way because of long exposure to blue Aurat Crystals. The Echoes strengthen and cement their weakened, frail and fragile bodies using Aurat Crystals, enabling them to act and fight as any other being – and often better. Their bodies are covered with numerous tattoos of words from their language and symbols with various meanings. Some impute the Echoes to be devoid of feelings, because calm may be almost always seen in their faces and moves. However, these accusations are wrong. The Echoes experience feelings like other creatures. They just don't show them. The Echoes are modest in speech and gestures. They often quell their emotions. Peace and quiet that nature gives them are considered very valuable. They have a sense of humor, but most frequently they are serious. Vulgar jokes do not amuse them. A joke must have its point and logic. The Echoes are very sober and try to limit abstract thinking to a necessary minimum. Nevertheless, their architecture and artifacts are highly valued and commonly considered beautiful. The Echoes like adornments, but with moderation. They do not flaunt them, treating them like ordinary elements of their attire. Population of the Echoes is drawn around Convents. All their Convents share common ideas and culture, but they vary in sizes of their populations, customs and traditions. In the society of the Echoes, males and females are equal. The only exception is their clergy, comprising exclusively the females. 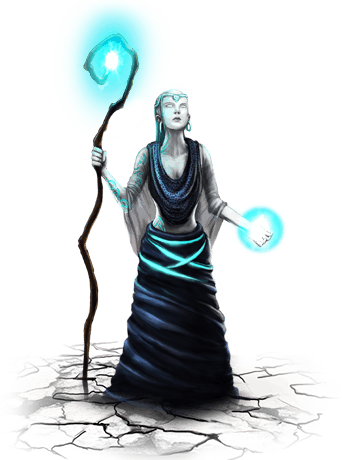 The Echoes society is guided by Puritis, the most revered of all High Priestesses. She is aided by the Council of High Priestesses, including representatives of clergy from all Convents. The clergy guards the spiritual purity of the Echoes' representatives. Priestesses lead the Echoes to enlightenment, care for their inner balance, and also look after nature – if it is needed, because the Echoes assume that if there are no severe outer influences, the nature will get along. Only females belong to the clergy. An Echoes female is a traditional spiritual guide, just as in the very beginning, when ancestors of the Echoes sought a new home. Their first guide was female, who then became a priestess. The Echoes strive after harmony with nature and other races. They fight with those who threaten their kind or the natural balance. They stand up for nature when it is needed, however without fanaticism. Animals are treated by them as friends and allies, and with reciprocation. 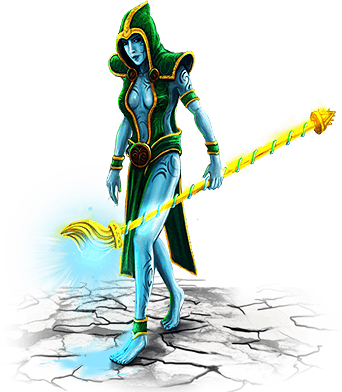 The Echoes use tools strengthened with Aurat Crystals to cut trees and kill animals. It is their homage to nature. However, they do not kill without a reason. They also apologize for the harm they made. In the culture of the Echoes, also memories of their ancestors are important. They always note the achievements of previous generations and emphasize beneficial examples. Technology of the Echoes is based on Aurat Crystals. Thank to these Crystals, inanimate artifacts may move to some extent. Nature eagerly steers to these Crystals, craving to draw energy from them. Owing to this, plants and animals become healthier, stronger, and more fertile. The Crystals stimulate growth of plants, which are also elements of the Echoes' buildings. In such a way, the buildings assume shapes consistent with intentions of their creators. The Echoes erect monumental buildings of sandstone, granite or marble. Their roofs are covered with tiles shaped like dragon scales. Also precious metals are used very often. Aurat Crystals are commonly used, as well as inscriptions of Aurat mass in granite, which may be seen on the foundations of some buildings. Architecture of the Convents is characterized by soft arcs, high stained-glass windows and omnipresent flora that covers walls, roofs and floors. Flags with convent or race symbols and inscriptions may be seen often, as well as statues of dragons or meritorious ancestors. Walls and ceilings are covered with murals showing notable episodes from the history of the race. Floors are adorned with mosaics. The Echoes practice a harmonious combination of natural and artificial elements. There are many ornaments and other decorations in their buildings. They commonly use water in their architecture. They also fancy statues and adorned stones. An Aurat Crystal is blue. It gently shines with inner glow. Just after its formation, it looks like any other jewel – very irregular and unpolished. Aurat strengthens and cements bodies of the Echoes, enabling them to live and fight normally. It is now a necessity, as their bodies are too weak and fragile. The Crystals give strength, resistance to diseases and endurance better than those of a human. Presence of a Crystal has a very good influence on nature. Plants cling to it, utilizing its power. Thanks to it, they grow faster and better, are healthier and more resistant to diseases. 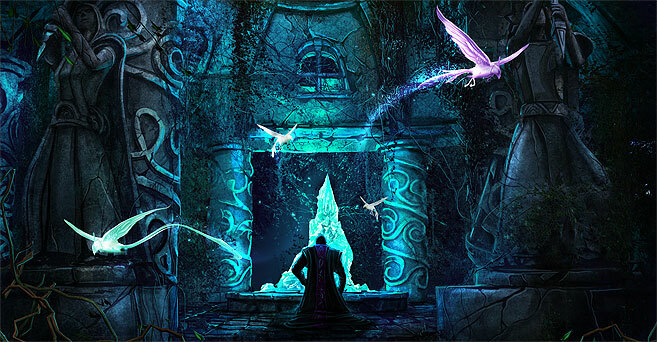 While left alone, a Crystal will be quickly surrounded by plants, so the Echoes must control their growth to some extent. In this way their buildings form, being a symbol of unity of civilization and nature. The Aurat Crystals give also light and warmth, and soothe persons looking at them for long or staying near them. Prolonged presence of the Crystals may cause physical changes in living creatures. That is why skin and eyes of the Echoes are blue. The first two dragons needed some time to get accustomed to the Echoes. Finally the Echoes managed to tame them, mostly thanks to magic. Since then, the dragons were mounts and companions of the Echoes. However, considering their limited number, they served only selected, the most worthy persons in the Echoes' society. The long-living reptiles fulfill various duties among the Echoes. Most of all, they are mounts and protection for important persons, such as High Priestesses. Sometimes they participate in exploratory expeditions and military campaigns, other time they guard important objects. Rarely, they fight in large battles. The cause is simple – enemy seeing a great and dangerous beast in the sky, focuses their attacks on it. A dragon is the most perfect example of wisdom of nature for all of the Echoes. Its strength, agility and beauty quickly made it an vital element of the Echoes' architecture. Language and symbols used by the Echoes are also called dragon's language. Apart from the company, a dragon provides the Echoes with fire and scales. Dragon fire burns longer than ordinary fire, it is also warmer and lighter. Dragon scales are obtained naturally, when the dragons slough. The process occurs every fifteen years on average. The greatest warriors of the Echoes wear scale mails made of dragon scales. As the Echoes inhabit human territories, they entered a treaty with the Humans. The Echoes do not interfere with matters of human countries, and the Humans leave the Convents in peace. There is one exception: war of the Humans with the Steamers. 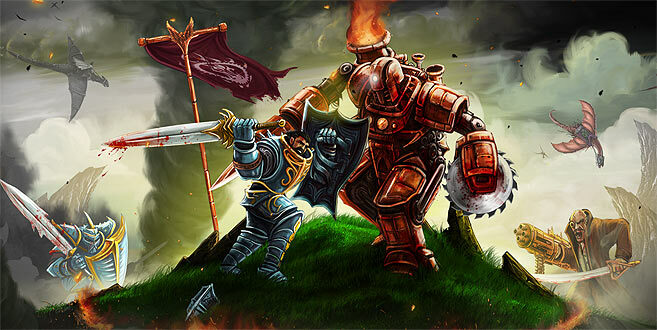 Considering the threat posed to nature by the Steamers Great Empire, and big advantage of steam warriors over those of the humans, the Echoes agreed to join the fight and to stand by the Humans.